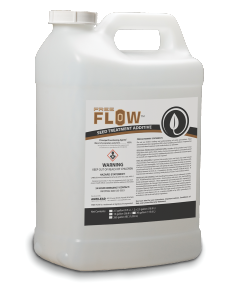 Free Flow is a liquid seed treatment additive that when mixed with slurry, improves coverage on the seed, speeding drying time, and dries to hardened water soluble micro-film which reduces dusting-off. Use Free Flow to improve treated seed flowability from the point of seed treatment to the point of seed planting. Different than most other polymer-type products, Free Flow remains free-flowing in the jug before use and helps seed remain free flowing after treatment. Free Flow is broadly compatible for use with insecticides, fungicides, nematicides, plant growth regulators and other seed treatment products labeled for seed treatment. Free Flow is rhizobia friendly when mixed and applied with inoculants and other growth promoting biologicals. Rates can be adjusted to achieve a wide range of performance.